Blurb Description:When Sky falls from Blackfin Pier and drowns on her sixteenth birthday, the whole town goes into mourning – until she shows up three months later like nothing happened. For three months, she was dead. Three whole months, that she thought she was alive for, but actually wasn’t. And now, she has to deal with the repercussions of living in an offbeat town, being the girl that people used to be in awe of, even before she came back from the dead. Getting her answers, however, must happen fast. For Sky is fading out, losing time, and memories of a strange circus and sinister people plague her dreams along with wolves, fires and amber skulls. 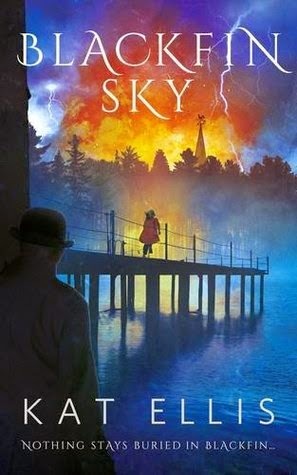 Blackfin Sky was NOTHING like I expected to be, but EVERYTHING you would look for in a paranormal/ fantasy book. It will make your heart pound faster, your fingers flip the pages faster and your brain trying to process the mastery that Kat Ellis has managed to produce!